Do you want to design games? Are you already a game designer? 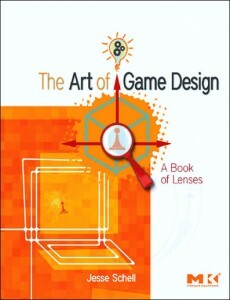 You need to read Jesse Schell’s The Art of Game Design: A Book of Lenses. It doesn’t matter if you want to design board games, roleplaying games, or video games, this book has tools you can use. In fact, I would say The Art of Game Design transcends the medium of games and is an excellent resource for any type of design. Even Game Masters should find this book very useful. Schell draws from the disciplines of design, philosophy, and psychology combined with his experience in the industry to provide a set of 100 lenses through which to examine your game to make it better. This book meets my expectations on what an entire game design college program should provide. The lenses Jesse give his readers are really just a set of questions that a designer should ask about his game to ensure it will meet the expectations of the game’s target audience. These lenses give the designer the necessary perspective that will make games great. Of course, you can’t read a book and expect it to make you a great game designer, or even a mediocre one. That takes years of practice, but applying the concepts presented in The Art of Game Design should help put you on a faster track to success. In the future I want to revisit The Art of Game Design and take a look at the lenses Jesse Schell has come up with. Right now I want to discuss the first lens, the Lens of Essential Experience. The above excerpt is from page 21 of The Art of Game Design by Jesse Schell. This lens kicks everything off; posing the first question a designer should answer about his game. What is the essential experience that players should have and how do you convey that experience? A designer should probably extend this lens and make sure that any element added to the game’s design reinforces the essential experience. If you’re a Game Master, you might still be wondering why this book would be valuable to you. Well, Game Masters ARE game designers. Sure, you may not be designing the rules, but you are designing the EXPERIENCE. These lenses should help you shape your campaigns into unforgettable experiences for your players. You could think of it as a Campaign Toolkit. This book gets a full 5 flask rating and my highest recommendation! That’s so awesome. I have always been fascinated how these awesome games are made. Now I can have a look and see. Thanks for the information. Cheers.